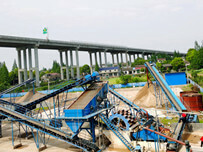 What is LZZG sludge dewatering belt filter press? 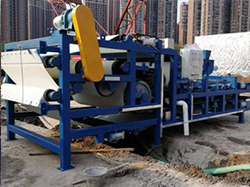 LZZG Sludge Dewatering Belt Filter Press is a widely applicable product for efficient dewatering of sludge from municipal, industrial, mining and aggregaes wastewater treatment. 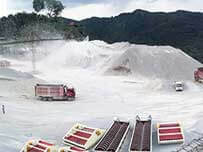 Especially suitable for dewatering of tailings mud such as iron ore, copper ore, lead-zinc ore, fluorite ore, bauxite or rare earth ore; Dewatering operations such as ore dressing wastewater, sand washing mud, and wash plant sludge. The slurry is sandwiched between two tensioned porous belts, by passing those belts through a serpentine of decreasing diameter rollers. Water is then removed from the slurry and a solid material is produced. How does belt filter press work? The sludge is evenly fed into the mesh belt through the cloth bucket. 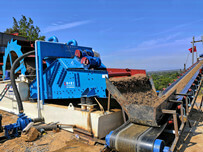 The sludge runs forward with the filter belt. The free water flows into the water tank through the filter belt under the action of its own weight. The main function is to remove the free water in the sludge, so that the fluidity of the sludge is reduced and ready for further extrusion. 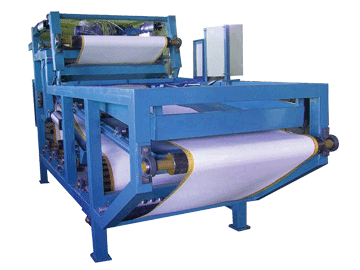 The filter cake is repeatedly pressed and sheared around the press roll by the upper and lower filter belts. 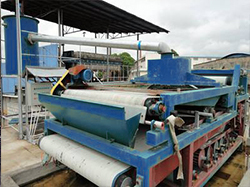 A large amount of capillary action water is removed to gradually reduce the moisture of the filter cake. An easily adjustable and variable wedge compression zone that maximizes process rate and performance. Suitable for all types of organic sludge and inorganic mud, municipal WWTP sludge, pulp &paper sludge, water plant sludge. The belt press is constructed with a stainless steel structure and rollers, durable for more than 10 years . Low power is needed to run the belt filter press. With long term value and ease of operation. 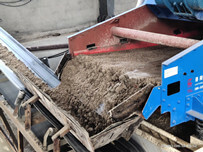 Various types of industrial wastewater sludge, such as sand-making mud, washed sand mud, mine tailings, piling mud, river silt, etc are produced. They are pumped to the deep cone thickener, the flocculant is added to the tank, and the concentration of the sludge in the thickener is increased by 60%-70% under flocculation and gravity precipitation. Then sent to the belt filter press, under the action of a gravity zone, a wedge zone, and a pressure zone , the mud cake with water content of less than 20% is obtained and the overflow clean water for re-processing.